In this lesson, we will learn what are acute angles and right angle. What is a right angle. There are many types of angles. As a start, we will learn about these two types of angles. We will proceed to the other types of angles after completing this lesson. 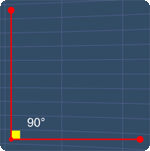 Right angle is exactly equals to 90°. Acute Angles from MathExpression.com on Vimeo. In this lesson, we will learn about acute angles. Now, since this angle, is somewhere in between 0 degrees and 90 degrees, it is an angle. Hence, we can say that an acu. angle, is always greater than 0 degrees, and lesser than 90 degrees. Let's see some examples to understand this better. Consider this angle of 80 degrees. Is this an acu. angle? Yes! it is. How about this angle, of 35 degrees? Yes! It is an acu. angle. Alright, take a close look at this angle. Is this an acu. angle? We know that, an acu. angle, is always greater than 0 degrees. This is true, for this angle. Also, it is always lesser than 90 degrees. Again, this is also true, for this angle. Next, how about this angle? Clearly, this angle is greater than 90 degrees. Right Angles from MathExpression.com on Vimeo. In this lesson, we will learn about right angle. By now, we should know that, acu. angles must be in between 0 degrees, and 90 degrees. So, what happens if the angle is 90 degrees? When the angle is 90 degrees, it will be called, right angle. Now, this angle is quite special. It has its own square symbol, to represent it. To emphasize again, the right angle simply means that, the angle is 90 degrees. Now, let's see some examples on this. Is this a right angle? Yes! It is. How about this? Yes again. Next, is this a right angle? No, it is not. You can start by going through the series of questions on acute angles and right angle or pick your choice of question below. Question 1 on identifying acute angles. Question 1 on identifying right angles.